WebFOCUS Business Intelligence Portal (BI Portal). BI Portal enables you to build complete, modern websites with multi-levels of navigation. You can have as many levels as you like. Content is dynamic and end users experience the click-and-drag behavior that they are familiar with in popular online portals. This is a key feature, as end users do not need to learn anything new. While at work, people should have the same satisfying experiences that they have every day when reading news, reading email, and performing other activities. With BI Portal, the result is zero product training and a high usage rate. With this product, a portal is easy to build. BI Portal uses the same familiar ribbon interface as the WebFOCUS InfoAssist report development tool. Building a portal is just a matter of a few clicks and click-and-drag actions. With BI Portal, anyone who can build a report using InfoAssist can develop an impressive portal without any knowledge of web design. For more information on BI Portal, see the Business Intelligence Portal manual. For questions regarding licensing, contact your Information Builders branch representative. WebFOCUS Business Intelligence Dashboard (BI Dashboard). The BI Dashboard is an HTML-based thin client that enables you to create a customized user interface to access WebFOCUS Managed Reporting. In WebFOCUS 8, the BI Portal is the successor to the WebFOCUS BI Dashboard. The BI Dashboard is available in WebFOCUS 8 to customers with active Managed Reporting licenses for earlier WebFOCUS releases who want to migrate their existing Dashboard views. For more information on the BI Dashboard, see the Business Intelligence Dashboard manual. For questions regarding licensing, contact your Information Builders branch representative. If you installed the Portal with the WebFOCUS Client, you should verify that the interfaces are accessible, as explained below. Note: In addition to these interfaces, you can create and run independent WebFOCUS applications and reports using Developer Studio. Developer Studio is installed separately from WebFOCUS on Windows machines. Developer Studio provides GUI tools to help developers create advanced web reporting applications that use WebFOCUS to report on data. Using Developer Studio, you can also create Maintain applications that update, as well as report on data. Caution: If you installed a pop-up blocker for your browser, you must disable it when accessing the Portal. It is recommended to access the Portal to confirm the installation and set the administrator password. Are the host name and port of the web server. However, if you use an application server only configuration, then these are the host name and HTTP port of the application server. If you require SSL, use https instead of http. Sign in as an administrator. The default user name and password are admin and admin, respectively. By default, BI Portal accounts are created and administered from within the Security Center interface and are not related to the accounts used for the WebFOCUS Reporting Server. This default sign-in behavior can be customized using the procedures and steps detailed in the WebFOCUS Security and Administration manual. The WebFOCUS Business Intelligence Portal Welcome page opens in your web browser, as shown in the following image. 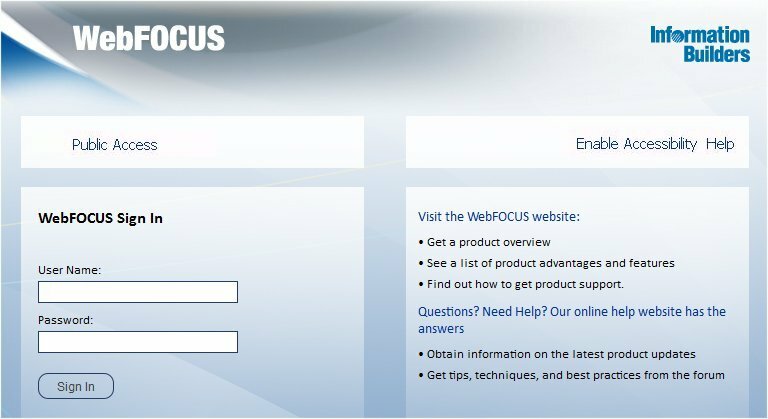 Note: If the WebFOCUS Business Intelligence Portal Welcome page does not appear, verify that your web server is running and that the proper aliases have been defined. If you did not migrate, set a password and email address for the admin account as follows. If you use both Report Library and Managed Reporting, this is required. Select Security Center from the Administration menu. Right-click a user name and select Edit from the context menu. The Edit User dialog box opens. Enter an email address to use for the administrator in the EMail Address field. The Set Password dialog box opens. Set and confirm the password. If you use ReportCaster, this should match the password you set for the ReportCaster Administrator in Verifying ReportCaster. You are returned to the Edit User dialog box. You are returned to the Security Center dialog. Return to the main WebFOCUS Business Intelligence Portal and optionally create a report using InfoAssist. If you are unfamiliar with Managed Reporting, refer to the Managed Reporting manual or click the Help tab. If you receive errors while using InfoAssist, your application server may not be properly compiling JSP files. For details on resolving errors in compiling JSP files, refer to Java Version Requirement. You can optionally verify that the Business Intelligence Dashboard is properly configured by accessing the View Builder. You can also select View Builder from the Tools menu in the WebFOCUS Business Intelligence Portal.